Arthritis - body, last, viral, contagious, causes, What Is Arthritis? Arthritis refers to inflammation of the joints, often accompanied by pain, stiffness, or swelling. Arthritis may occur in many different diseases and medical conditions. For many years, Jenny's father was a dedicated runner. He got up early each morning for a 3-mile jog, and on weekends he sometimes ran as far as 10 miles or competed in road races. He even talked about training for a marathon, which would mean running more than 26 miles in one race. Gradually, however, Jenny began to hear her father mention that his knees were hurting when he ran, and that they remained painful for a few hours after he stopped. Jenny noticed that his knees looked swollen, and that he sometimes had trouble sleeping because the pain annoyed him so much. Jenny's father assumed the pain was simply a running injury that would get better with rest. But when the pain did not go away, Jenny's father visited a doctor. He was told he had a type of arthritis known as osteoarthritis (os-te-o-ar-THRY-tis). This surprised Jenny, because her father was only in his forties. She thought that arthritis was only a problem for older people like her grandparents. Arthritis is a common problem for many older people, but it can affect anyone, from toddlers to centenarians * . Although people use the term as if it were only one disease, arthritis actually refers to a condition found in a large group of disorders. The major symptoms of arthritis affect the areas in and around joints, making them stiff, swollen, and often painful. In addition to the joints, certain types of arthritic diseases may affect other parts of the body, including the heart and lungs. As a group, the various forms of arthritis are among the most common medical conditions. About 1 of every 6 people, or more than 40 million Americans, have it. Arthritis usually is chronic, which means the problem can last to some degree for months, years, or the rest of people's lives. * centenarians are people who are at least 100 years old. * rheumatoid arthritis (ROO-matoid ar-THRY-tis) is a chronic autoimmune disease characterized by pain, swelling, stiffness, and deformation of the joints. These conditions develop for a variety of reasons, but they are not contagious * . Some forms of arthritis, however, can develop from contagious infections, like sexually transmitted diseases or viruses that cause mumps and rubella (German measles). One form of arthritis, Lyme disease, develops from the bite of an infected tick. Sometimes arthritis occurs as one of the symptoms seen in conditions that primarily affect other organs. For example, inflammatory bowel disease may have arthritis as one of its symptoms. * gout occurs when deposits of uric acid in the joints cause inflammation and pain. * fibromyalgia (fi-bro-my-AL-ja) is a group of disorders that are characterized by achy, tender, and stiff muscles. * contagious means transmitted from one person to another. Jenny's father has osteoarthritis, the most common type of arthritis in adults. About 21 million Americans, almost half of those with arthritis, have this kind. Osteoarthritis is sometimes called "wear-and-tear" arthritis. Arthritis may affect many different parts of the body, including shoulders, elbows, hands, hips, and knees (left). In healthy joints (top right), a flexible cushion of cartilage allows bones to slide past each other smoothly. But in arthritis (bottom right), cartilage loss forces the bones to touch without their usual cushioning, which creates pain and inflammation. That is because the pain, stiffness, and swelling often result from the wearing down of the protective tissues within and around joints. Osteoarthritis is sometimes called "wear and tear arthritis" and often affects the knee joints, making them stiff, swollen, and painful. Dr. P.Marazzi/Science Photo Library. Photo Researchers, Inc. The human body contains more than 150 joints that connect more than 200 bones. There are small joints in toes and fingers; larger ones in the spine, elbows, and knees; and even bigger ones like the hips and shoulders. The bones do not touch directly. Instead, a tough, smooth, rubbery layer of tissue called cartilage covers the ends of the bones. When a knee, elbow, or other joint moves, the cartilage allows the bones to slide past each other smoothly. Cartilage also is flexible and absorbs some of the weight placed upon certain joints, such as the knee. 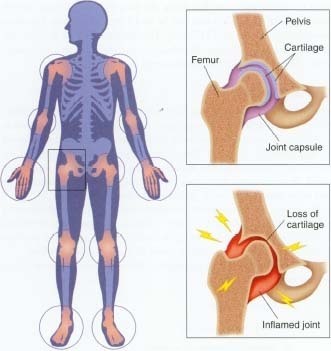 People with osteoarthritis, however, have lost some of the smooth cartilage in their joints. Eventually, the cartilage can wear away so much that the ends of the bones touch without any cushioning. The bones also can grow small spurs or bumps, which is why some people with osteoarthritis have lumps in their joints. These lumps often are most noticeable in the hands. Osteoarthritis usually is felt first in the knees, hips, feet, spine, or fingers. These are joints that bear much of the body's weight or are used often for everyday activities. The pain increases as the cartilage between the bones is worn down. People often start to avoid using the joint. For example, people might exercise less if pain is in the knees. This only makes the problem worse. It leads to increased stiffness, because muscles around the joints begin to weaken from disuse. No one is exactly sure why osteoarthritis happens, but often it results from stresses placed on the joint. In the example of Jenny's father, his years of running on hard surfaces caused damage to his knee cartilage. The pounding on pavement was too much stress for the cartilage to absorb. Other types of stress or injury also can lead to osteoarthritis. People whose jobs involve hard physical labor (like construction workers) or repetitive tasks (like assembly line workers) can develop osteoarthritis. An injury to a knee or elbow also can increase the risk of osteoarthritis. Certain activities like football or ballet can put a person at greater risk for developing osteoarthritis. Even the stress of too much body weight contributes to the disease. People who are significantly overweight are more prone to osteoarthritis because their weight places extra stress on joints, especially knees and hips. Many older people also develop osteoarthritis, even if they never put extra stress on their joints. That is because as people age, the rubbery cartilage tissue loses some of its ability to stretch and can become thinner. This places people at greater risk for osteoarthritis as they age. Not all older people develop osteoarthritis, just as not all runners or laborers do. This is one reason doctors believe heredity may play a role in determining who is at greatest risk for this type of arthritis. It is important to understand what type of arthritis people have, because treatments vary. Doctors diagnose osteoarthritis based on the symptoms they see. They might look for loss of cartilage and bone spurs with x-rays. Doctors also look for other causes of the pain. For example, blood tests can show if the problem is rheumatoid arthritis instead. If it hurts, why do doctors want patients to exercise? Once doctors have determined the problem is osteoarthritis, they tell patients something that might seem to make little sense. They want them to exercise the joint. This does not mean Jenny's father should return to running. It does mean he and others with the disease need to work with their doctors to find the best way to exercise. Appropriate exercise can strengthen the muscles around the joint and help lessen the stiffness. Often, the exercises are different from those done in the past. Some give up running for swimming or water aerobics. Others walk or ride stationary bikes. If the pain is severe, a physical therapist who specializes in helping patients learn appropriate exercises might get involved. If people are overweight, doctors advise them to take off the pounds. The pain of arthritis is often treated with aspirin or other over-thecounter drugs that reduce swelling. There also are prescription drugs that are stronger and can help if the pain is extreme. Often the pain of osteoarthritis decreases with treatment. For some people, however, surgery is performed to remove stray pieces of damaged cartilage, to smooth bone spurs, or in severe cases to replace damaged joints with mechanical ones. Hips and knees are the most likely candidates for replacement. The ancient Greeks believed the body was filled with various substances they called "humors." Sometimes they said the humors got out of balance and caused illnesses, such as-the aches and pains of swollen joints. The humors, they believed, could get back in balance, and the pain would subside. But the problems also could return. One disease the Greeks observed is what we now call rheumatoid (ROO-ma-toid) arthritis. "Rheuma" derives from a Greek word that means "flux" or "discharge." The Greeks believed the humors were fluxing, or flowing, through the body to cause the bouts of pain. In a way, rheumatoid arthritis is a disease in which substances in the body are out of balance. The body fights infections with chemicals known as antibodies. But in rheumatoid arthritis, the antibodies turn against healthy areas of the body and cause the thin covering around joints to become inflamed. The pain usually starts in the hands or feet, but rheumatoid arthritis can affect many different joints as well as other parts of the body, like the heart and lungs. The disease's cause is unknown. Some researchers believe that the immune system's attack on healthy tissues may be caused by the body's overreaction to viral infection. More than 2 million Americans have rheumatoid arthritis, and most of them are women. Although it can start at any age, including a juvenile form that children get, the disease usually strikes women between the ages of 35 and 50. 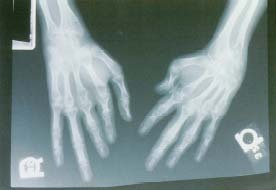 Doctors use x-rays to diagnose rheumatoid arthritis, which often affects the hands. People with rheumatoid arthritis may feel stiffness when they wake up in the morning, and their joints may feel warm to the touch. © 1998 Michael English, M.D., Custom Medical Stock Photo. It is known as the most disabling of the various diseases that cause arthritis. Rheumatoid arthritis can lead to deformed joints, extreme pain, and loss of the ability to do common tasks like walking. The symptoms of the disease can develop in a few days, months or years. For most people, a joint in the hands, feet, arms, or legs feels stiff, as it does in osteoarthritis and other forms of arthritis. Rheumatoid arthritis, however, has a few distinctive features. People tend to feel worse in the morning after awakening. They also can get a fever, and their joints can seem warm to the touch. At first, the antibodies damage only the thin covering around joints. This covering contains cells that produce fluid that keeps joints lubricated and working properly. As the covering is damaged, it becomes thicker. Soon, damaging cells appear and eat away cartilage, bone, and other tissue. Swelling and pain result, and the joints become deformed. People with rheumatoid arthritis also can develop small bumps around joints, especially hands and elbows. Often, the disease flares up and then subsides on its own. Some people, however, receive no relief without treatment. Doctors diagnose rheumatoid arthritis with special blood tests. They also look for other causes of the joint problems and use x-rays to look at the spaces between bones to see if they are narrowing. Over-the-counter medications like aspirin can ease the pain. Stronger prescription pain relievers and anti-inflammatory drugs also are available. Weight loss is urged for people who are too heavy. Some people need surgery to replace badly damaged joints in the arms, legs, or hips. Many people, however, learn to live with the disease through a combination of rest and exercise. When the symptoms are at their worst, patients with rheumatoid arthritis try to avoid putting stress on the joint to help reduce damage to the joint. But when the symptoms are less severe, doctors want the patients to exercise to maintain flexibility in the joints and strength in the muscles around them. Patients with rheumatoid arthritis often learn relaxation techniques, because the disease is known to flare up in times of emotional stress. Juvenile rheumatoid arthritis is one of several common forms of juvenile arthritis that cause swelling and pain in the joints. There are a great variety of symptoms among children with arthritis. The causes are unknown, although heredity is believed to play a role. Juvenile rheumatoid arthritis affects children under age 16. Although very similar to the adult form of rheumatoid arthritis, 50 to 75 percent of young patients will "outgrow" the disease. Children are treated the same way that adults are: with pain medication, exercise, and careful treatment to prevent joints from becoming deformed. What Are the Other Forms of Arthritis? Gout causes extreme pain that develops suddenly, often in the big toe. The pain, swelling, and redness develop because uric acid crystals build up in the joint. Uric acid is a natural substance found in the body that usually is passed out through the kidneys and urine. When uric acid is not removed from the body, crystals form and settle in the joints. Gout often is associated in people's minds with excessive eating and drinking. Although those activities, as well as obesity, increase the risk for gout, it can develop for no apparent reason. About 2.1 million Americans have gout, and about 90 percent of them are men. Fibromyalgia causes pain in the muscles and in the ligaments and tendons that are attached to bones around joints. Often, people with fibromyalgia are excessively tired and have trouble sleeping. The causes are unknown, although people with the disease often experience psychological stress. This does not mean the disease or its pain are not real. Unlike other forms of arthritis, fibromyalgia affects muscles and tissues around joints, not the joints themselves. It also does not lead to permanent damage. More than 3.5 million Americans have fibromyalgia, and most of them are women. Lupus is a disease that affects joints as well as other body parts, like the kidneys, nervous system, heart and skin. There are many symptoms of lupus, including fatigue, rashes, chest pain, fever, and sensitivity to sunlight. Like rheumatoid arthritis, lupus is an autoimmune disease with no known cause. In autoimmune diseases, the cells in the body that usually fight infections attack healthy cells and tissue instead. The disease mostly strikes women in their childbearing years. Women of African ancestry are almost three times as likely to develop lupus as women of European ancestry are. Overall, it affects as many as 500,000 people in the United States. About 355 million people worldwide have arthritis, according to the Arthritis Foundation. Some forms, like rheumatoid arthritis, appearto be increasing in the developing nations of Africa, while their incidence appears to be decreasing in the United States and Western Europe. About 40 million people in the United States (15 percent of the population) were reported to have arthritis in the late 1990s. But as baby boomers age, those numbers are expected to rise. By 2020, close to 60 million people in the United States are expected to have arthritis. Florida has the highest percentage (almost 20 percent) of residents with arthritis. By 2020, it is still expected to lead the nation, with almost 25 percent of its residents having arthritis. Alaska, with about 10 percent of residents having arthritis, has the lowest percentage now. It also is expected to be the lowest in 2020. Arthritis affects all age groups, including more than 275,000 children underage 17. Almost two thirds of people with arthritis are females. Among older women, it is the most common chronic condition. In the United States, the estimated cost of arthritis to society is about $65 billion per year. About 25 percent is due to medical costs, and the remainder is from lost wages and productivity. When the new arthritis medication Celebrex was released for sale in the United States in 1999, it sold more than $600 million in new prescriptions during its first six months on the market. Lyme disease is a bacterial infection spread by the bite of an infected insect known as a deer tick. The first signs are usually fever and a red rash on the skin where the bite occurred. Joint problems may follow, but the disease usually can be overcome with medication. It is a special concern for people who spend time outdoors in certain regions of the United States. Severe arthritis can limit the ability to walk, dress, or bathe easily. There are a growing number of devices that are sold to help people with arthritis have an easier time with simple tasks. Such things as easy-to-open bottles, handles on poles to reach high objects, and electric scooters can help people with severe arthritis to live independently. With a fuller understanding of arthritis, its limitations, and its treatments, people with arthritis can lead full and happy lives. Rheumatism is a non-medical word that many people use to refer to many different forms of arthritis, including rheumatoid arthritis. Older men and women sometimes talk about "having a touch of rheumatism" when their joints ache, especially on cold, rainy days. Moyer, Ellen. Arthritis: Questions You Have-Answers You Need. Allentown, PA: People's Medical Society, 1997. An easy-to-follow book that answers dozens of questions about many forms of arthritis. Schwarz, Shelley Peterman. 250 Tips for Making Life with Arthritis Easier. Atlanta: Longstreet Press, 1997. Published in conjunction with the Arthritis Foundation, this book focuses on living with arthritis and describes ways to make homes friendlier to people with arthritis. The Arthritis Foundation, 1330 West Peachtree Street, Atlanta, GA 30309. A national support organization with many local chapters. It publishes books, brochures, and fact sheets about all aspects of arthritis. Many are posted on its website. The American Academy of Orthopaedic Surgeons, 6300 North River Road, Rosemont, IL 60018-4262. An organization of physicians. Its website offers detailed information about arthritis and joint replacement.